Nothing beats the feeling and look of a car that is properly washed and waxed and you probably have experienced this every once in a while. Usual car waxing costs a lot of money and it is really something daunting and challenging you would want to do yourself but with time and proper guidelines you can carry it out within a short amount of time. Car waxing is like many other procedures that you could do at home with a little difference and step by step procedure but you would have to know the tips carefully and understand them fully. With a little hard work and consumption of time you can have the look of your car as good as new. Before the procedure of car waxing actually starts off you should think about what sort of wax you are going to use for the process because that is going to have impacts later on for the appearance and overall look. You should select something that works out with any type of paint material and can withstand temperature changes easily. Wash your car before waxing it and make sure you aren’t using the detergent or the usual dishwashing soap for this purpose. It is going to strip away everything from the paint of the car leaving it really oxidative and rusty for the damage and atmosphere conditions. 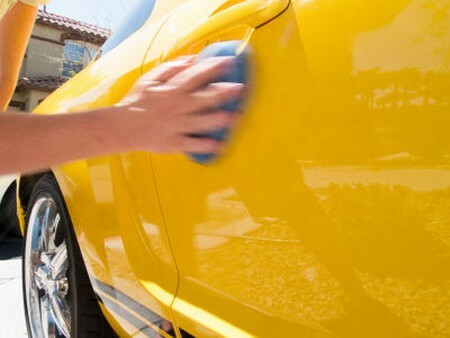 Use a proper car washing agent to do so and wash the exterior thoroughly before applying the wax. Use a soft towel or a sponge to apply the wax on the surface of the car. This will make the surface smooth and really shiny for the appearance. You should always apply the wax when the car surface is cool and not as hot; you can park your car in the shade for the cause. Apply the wax on a small part of the paint making sure nothing is getting ruined beneath. Avoid applying the wax on the corners of the mirrors and door rubbers because it will totally ruin it. If there is any place like that left out, clean it in the end. You should clean the dust and smaller particles that might be coming in your way as well. While the process of car waxing is going on, you should notice that the minor defects of your car would be vanishing away and the outer surface would be clean and covered with a thin transparent coating.